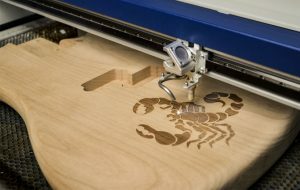 For this particular article, we are going to be focusing primarily on laser engravers as opposed to laser cutters as the engravers are where most people will start with due to size and cost. A full blown commercial laser cutter can be hundreds of thousands of dollars if you want to go that route. But for many people just starting out, a small cutter or engraver usually does the trick. Some of the links on this page are affiliate links and as an Amazon Associate I might earn a tiny amount from qualifying purchases. Epilog’s laser cutters enable manufacturers, enthusiasts and contractors to make anything from the idea of a simple machine, through packaging, to trophies and awards. Laser equipment can cut wood, paper, plastic, fabric, foam and more with such high precision and speed that lasers have a clear advantage over other types of cutting technologies. 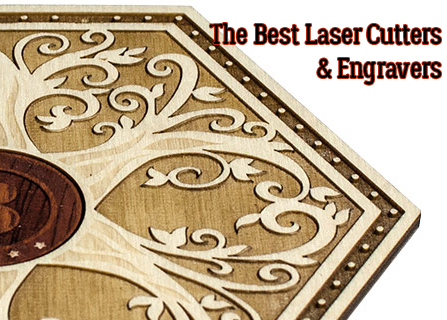 Laser cutting offers a high degree of precision and speed with good edge quality. Laser cutters can leave some dross on the edges of the cut part that you may have to clean up but it’s a pretty clean process. 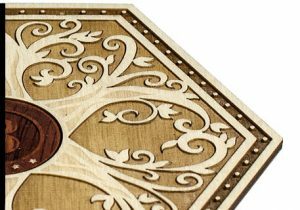 The epilog laser systems are very easy to use as they operare just like the a paper printer, helping you turn a drawing you make with graphics software into a finished part with the laser cut machine. 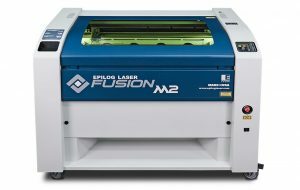 • The ability to engrave and mark metals with a fiber laser using your CO2 laser machine, which is available in the Fusion M2 series. A dual-source laser machine will further enhance your capabilities and help improve your company’s product offerings and benefits. • a camera registration option which is used for quick cutting with a laser cutter. Epilog uses a 3 camera option to give you very precise cuts. • The laser is connected to your computer via USB or Ethernet as a printer so you’re able to use the design software of your choice to create and cut your parts. • The electronically locked metal laser housing provides a Class 2 security level that enables safe use in any workshop, home or office. Epologue has quite a number of different models available and there is quite a range of prices between models. For example, the Helix can range from $17,000 to about $27,000. You can see some of the available models here. The latest model consists almost exclusively of steel and aluminum without printed or laser cut parts. 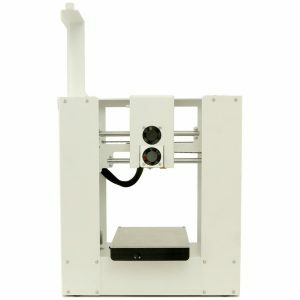 The printer housing is made of 3 mm matt black powder-coated aluminum, the extruder carrier is made of machined CNC aluminum and even the bearings and belt tensioners are made of CNC machined aluminum. All required parts, including a small 1.75 mm filament roll, are included, This laser kit uses a semiconductor laser diode mounted in a housing through an aluminum heat sink. My kit comes with a 2.5A driver, a 40mm fan driver, goggles, and an acrylic shield to prevent strong glare at 445nm. 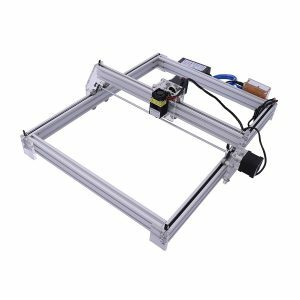 • The new Printrbot Metal Plus is a simple, minimalist design with a larger construction area, an improved linear rail system and of course a power coated metal frame. Print 10 x 10 x 10 (254 x 254 x 254 mm) objects with 1.75 mm PLA filament. • The linear rail and carriages provide stable and stable movement of the printhead and bed. • The machined aluminum bed is extremely flat and has a large construction area that can produce prints of up to 10 cubic inches. • The extruder is a 1.75 mm Ubis direct drive aluminum extruder with a 0.4 mm nozzle. • The printrbot laser cut can’t cut thick materials at high speed. Prices can range quite a bit for the printrbot but they start around $500 for a basic model – be sure to have a look and see what model might serve you best. The Zing Laser is one of the first fully functional cost-effective laser engraver on the market and has a cutting power of 25 watts and can engrave patterns in wood, acrylic, plastic, leather, cork, glass, processed metals and more. 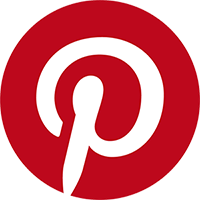 Wood – Cutting wood is one of the most popular uses for a Zing laser. With all of the different types and varieties of wood that is available with its styles, sizes and colors and its ease of use, wood is an extremely popular choice. It responds well to a laser and can be shaded by the machine, giving you the opportunity to do something like glaze a photo in the wood. 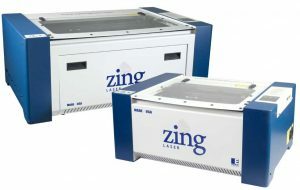 The Epilog Zing laser engraving machines 16 and 24 are used in almost every woodworking application that you can imagine. Glass – You would think that the laser simply passes through the glass without any effect, but it’s not the case. In fact, when cutting a CO2 laser freezes the glass. You can even design products that have curved surfaces such as bottles or glasses. For deeper etching, you can apply sandblasting to the glass, burn it with the laser and then sand blast again for a neat effect. Fabric – You cannot engrave fabric, but you can cut it safely. The cutting of tissue with lasers has become very popular. You can create complex designs and the good thing is that the laser attracts the edges of the fabric when cutting. The heat transfer material can be cut in the same way and then transferred to T-shirts or hats. Metal – The engraved metal can create a variety of valuable products. Many companies want barcodes engraved onto their machines and a laser is the only way to do it. Plastic – Engraved plastic is popular because many electronic gadgets are made from this material. Plastic is very easy to engrave or cut. The design options and business opportunities are endless. You could do anything from plastic name tags to very complex labels. Leather – leather can be nuanced, etched and engraved just like wood. Imagine you were engraving a family portrait on a leather handbag. With the Zing laser from Epilog, this is one of a thousand possibilities at your fingertips. The cost of a Zing Laser is around $10,000 USD but can vary on where you are located and what local distributors sell them for. When you’re looking for a laser cutter or engraver, the cutting envelope is going to be one of the most important things that you look at and it often translates into the biggest cost. The bigger the cutting area, generally the larger the cost of the unit. The other factor that comes into play is exactly what type of material the laser can cut. Most inexpensive, starter type engraver/cutters can cut a number of different materials other than metal. Once you get into a machine that can cut metal, it’s often one that is a little more expensive. For for our purposes here, we want to cover a couple different options but will remain on the smaller side of things – more a beginner level- where you won’t be able to cut metal. The other drawback is that typically for beginner-level machines, they aren’t intended for production runs or commercial use. They are more for smaller, “one off” type hobby projects. Starting at around $230 this little machine offers you the ability to carve materials like leather, plastic, paper, wood and bamboo. 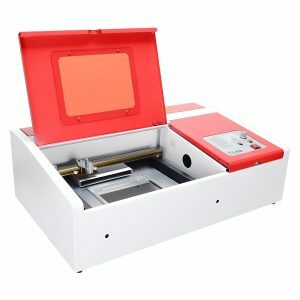 This is primarily an engraving machine – it’s not really designed to cut materials. You have a few different sized options for this machine, and it varies in price accordingly. You control the engraving and design by connecting through your computer using the cutting software which is available in English only at this time. This little machine is a pretty good way to get started if you’re interested in trying out a laser engraver. You can see the prices and more user reviews here. This is more of a laser cutter machine – so a step up from the Sunwing. Both machines use aluminum for the frame rails, but the Orion features German built bearing guide rails. The working area is 12″ x 8″ and uses a premium focal lens and a 40W CO2 laser. It’s designed to be used on most non-metal materials again like leather, wood, plastic, acrylics, glass, paper etc. The software for this is compatible with most graphics design programs like Corel Draw, and just like the Sunwing you communicate with the laser cutter through your computer. As this is a cutting machine, it also features a vent system for fume/smoke removal and extraction. This machine clocks in at about $410 and is a good way to get started with a small cutting envelope laser. 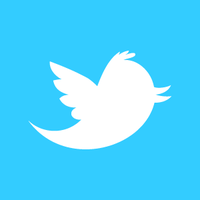 You can read more user reviews and see pricing information here. If you’re thinking about buying a laser cutter or engraver, I would highly recommend deciding what you are going to use it for first. Decide on the type of material you are going to cut or engrave and then decide on the working area as these are the main contributing factors to the cost of the machine you buy. If you won’t be cutting metal then the machine you need will be much cheaper.